BETHESDA, MD--(Marketwire - March 8, 2011) - DRS Defense Solutions, LLC a wholly-owned subsidiary of DRS Technologies, Inc., announced that its Sensors & Targeting Systems business unit was awarded a $32.5 million IDIQ contract to provide Integrated Vision Systems (IVS) for the U.S. Army Assault Breacher Vehicle (ABV). 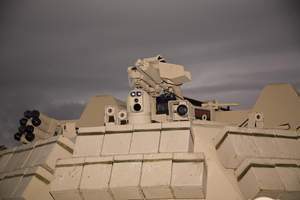 DRS Sensors & Targeting Systems (STS) received the five-year IDIQ contract for up to 106 systems from the U.S. Army Tank and Automotive Command (TACOM) in Warren, Mich. An initial order valued at $5.7 million has already been received. Deliveries are slated to begin in July of this year and continue through December. The units will be manufactured at the DRS Sensors & Targeting Systems (STS) operations in Cypress, Calif. STS had previously delivered 76 IVS' for the U.S. Army and Marine Corps under a separate contract. The Assault Breacher Vehicle is a tracked combat engineer vehicle designed to breach minefields and complex obstacles while providing in-stride breaching capability in order to maneuver forces. It is equipped with an IVS that allows operators to remain under the protection of armor while conducting their mission. Additionally, the ABV IVS also includes a two-axis stabilized gimbal sensor that provides 360-degree continuous vision with image intensified TV (I2TV), infrared (IR) and a laser range finder. "DRS is dedicated to mission success by equipping soldiers and Marines with enhanced situational awareness systems while reducing their exposure to enemy fire," noted Bob Viviano, vice president and general manager of DRS Sensors & Targeting Systems. "This award reflects success in our strategy to be the U.S. Army's preferred supplier for these products," said DRS Defense Solutions President and CEO Richard S. Danforth. "It also underscores the critical role that DRS Defense Solutions plays in support of our country's armed forces." DRS Defense Solutions, LLC, a wholly-owned subsidiary of DRS Technologies, Inc., is headquartered in Bethesda, Md. DRS Defense Solutions provides world-class products, services and systems integration in the areas of intelligence and sensor technologies, security, cyber, sonar, communications, electronic warfare, training systems, satellite communications, avionics, control systems and unmanned technologies. DRS Technologies, headquartered in Parsippany, N.J., is a leading supplier of integrated products, services and support to military forces, intelligence agencies and prime contractors worldwide, and is a wholly-owned subsidiary of Finmeccanica S.p.A. (FNC.MI), which employs more than 76,000 people worldwide. DRS' IVS includes a two-axis stabilized gimbal sensor that provides 360-degree continuous vision with image intensified TV (I2TV), infrared (IR) and a laser range finder. It allows operators to remain under the protection of armor while conducting their mission.